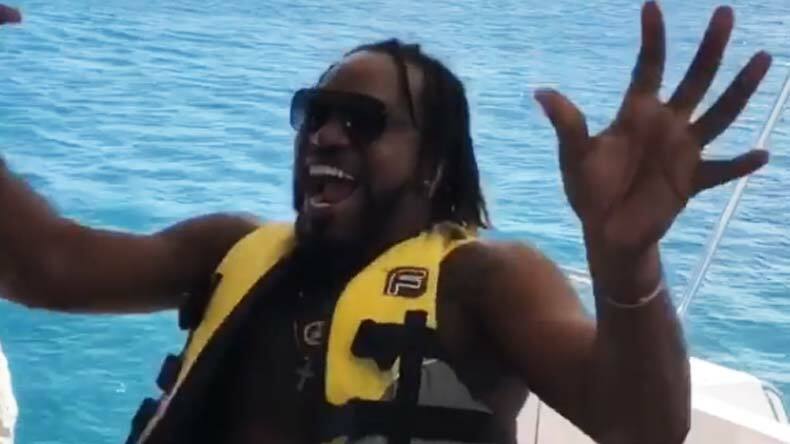 West Indies powerhouse Chris Gayle is on his way to India to join his Kings XI Punjab teammates for the Indian Premier League 2018. The 'Universe Boss' announced his arrival with a video of him dancing to Punjabi tunes on Instagram. Gayle was not in his splendid touch during the World Cup Qualifiers but will be aiming to make his presence felt at the IPL. West Indian cricketer Chris Gayle has already immersed himself in Punjab colours ahead of the start of the Indian Premier League (IPL) 2018. The Universe boss as he calls himself is gearing up for the fiercest T20 league in the world with a new team. He was picked by the Kings XI Punjab at the last minute of the IPL 2018 player auction after remaining unsold in the first round. The powerhouse was seen dancing on the tunes of a Punjabi song in the latest video that he has shared on his Instagram account. The swashbuckling batsman who has asserted his dominance as one of the most explosive batsmen in the world has been an IPL veteran of sorts having played aggressively for the Royal Challengers Bangalore as their opener. This time around Gayle, who has announced that the upcoming World Cup can be his last for the West Indies is rearing to make the most of it in the IPL 2018 where he will be taking the field for Punjab alongside some other big batsmen like Yuvraj Singh, KL Rahul and David Miller. The 38-year-old didn’t have a superb campaign in the recently concluded ICC World Cup qualifiers but had a few impressive outings including a ton that he plundered against UAE. Kings XI Punjab will be led by a new captain in Ravichandran Ashwin, they are yet to win their maiden IPL title but this time around the team looks formidable on all fronts with the right amount of experience and youth. Gayle is likely to take the opening spot for the Virender Sehwag mentored team with Aaron Finch or KL Rahul as his partner. The Southpaw has a remarkable IPL record with 3626 runs from 101 IPL matches at an average of astounding 41.20 and a magnificent strike rate 151.20. Apart from terrorising bowlers regularly, Gayle has also become a seasoned record breaker and holds the record of blasting the fastest 100 in the IPL. He is also the owner of the highest individual score of 175 in the cash-rich league. Expect fireworks from the West Indian when he takes the field for Kings XI Punjab.